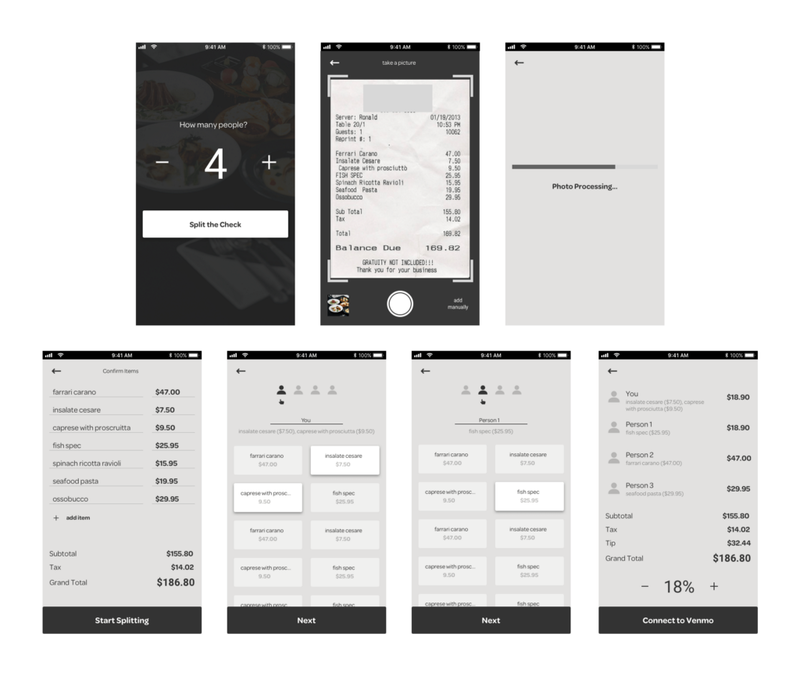 The app that allows users to easily split up their dinner bill. We’ve all been in that mildly awkward situation which occurs when dining out with a group of friends. The waiter leaves the group’s bill on the table and everyone looks around at each other. Oh boy, how are we going to split this one up? I will pay the bill… if you all want to just Venmo me later, or give me cash, or whatever. I spoke with waiters and customers about their experiences while dealing with the tricky situation of splitting up group bills at restaurants. Most people feel a slight negative emotion when asking their waiter to split their bill up. If customers express that they’d like to be on separate bills before giving their order to the waiter, the waiter can more quickly and easily deal with splitting bills up and are generally happy to do so. The rise of Venmo has made the group dining experience far less painful. People are often relieved when someone offers to pay for the meal and accept cash or Venmo payments as a reimbursement. Doing the calculations is the biggest pain point, especially in larger groups. A scenario map is a breakdown of all the different ways users might approach solving a problem and helps visualize precisely how many steps must occur within each possible scenario. Scenario 1 is the most time-consuming and has the highest likelihood of increasing friction among customers and waiters. Scenario 2 is slightly less time-consuming but still requires extra work on the part of the waiter. Scenario 3 is the least time-consuming but is also the least common to occur. The goal of this exercise is to account for all the various tasks involved in a process and identify the gaps that hinder or prevent that process from being completed. Creating a record of all the tasks and gaps associated with splitting a dinner bill helps to identify very concrete solutions and use cases that will be helpful during the design process. Based on my research, I identified two major pain points that need to be addressed. Waiters have more on their plate than customers know, and asking a waiter to split a bill up could cost them precious time and energy. Generally speaking, the dining group doesn’t feel great about asking their waiter to split their bill and would rather take it upon themselves when possible. Depending on the scenario, splitting a bill up may require some intense calculations. As the size of dining groups increases, and when you factor in shared dishes and drinks, the calculation problem grows accordingly. 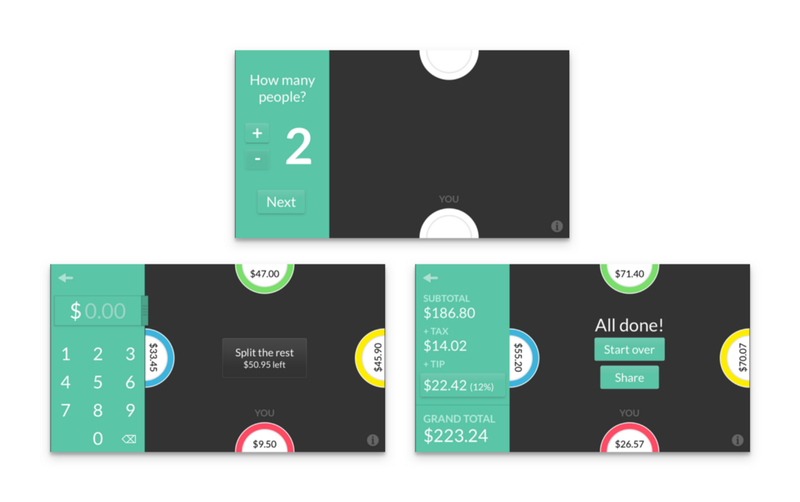 Plates by Splitwise and Tab are two apps that address the problem of splitting dinner bills. By enabling the user to take control of the situation and efficiently deal with splitting the bill up, the dining group can focus more on enjoying their time together and less time figuring out how to pay for their meal. By using technology that allows text to be extracted from a photo of a restaurant bill, the user can import the data into an application that will allow them to split up the bill without doing any math or data entry. 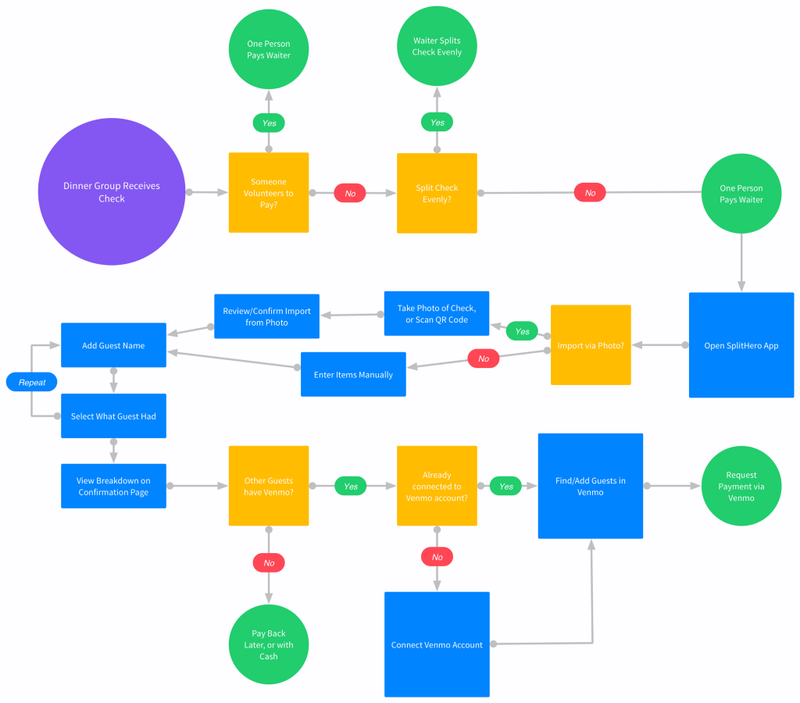 Diagramming the entire user flow from start to finish helps to illustrate all of the decisions and factors that will impact the user during the process. I started off working on rough paper sketches and quickly migrated into Invision’s Freehand tool in order to gain more control over each component of the design. 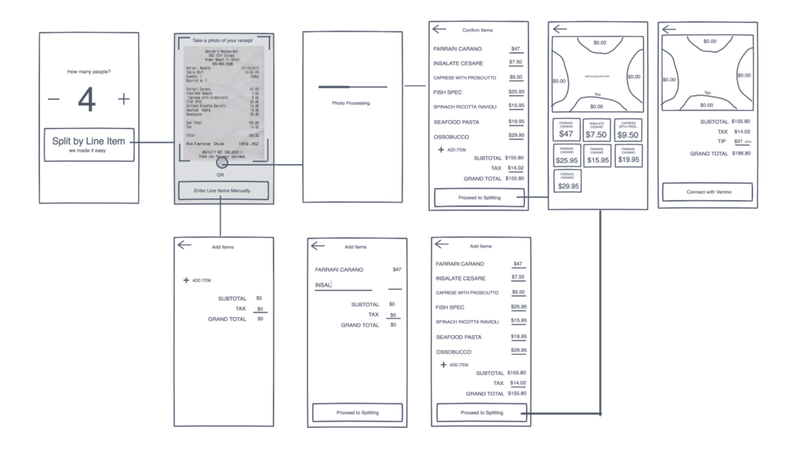 As the concept became more coherent and tangible, I created gray box wireframes in Sketch in order to move a little closer to a high resolution concept. These wireframes would eventually become the basis for my prototype. 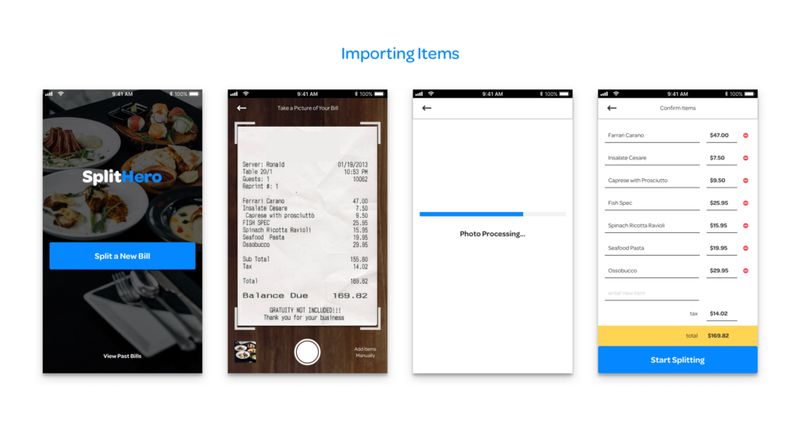 Design Solution: Allow the user to import their bill by taking a picture of it, or by entering each item in manually. Design Solution: A flexible item selection screen allows users to add people to the bill and select their items in any order. 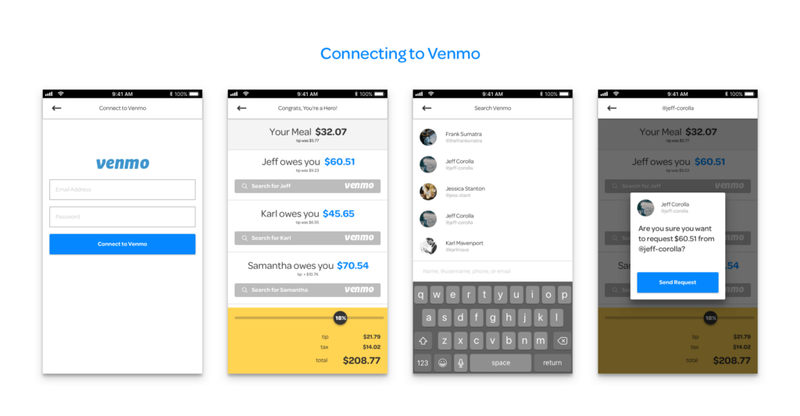 Design Solution: Allow users send payment requests via Venmo. Nearly all users were quick to identify the tasks necessary to complete each stage of the process. Users were largely comfortable with every new screen and challenge. Flexibility — Need to add the ability to edit/remove people from a bill. 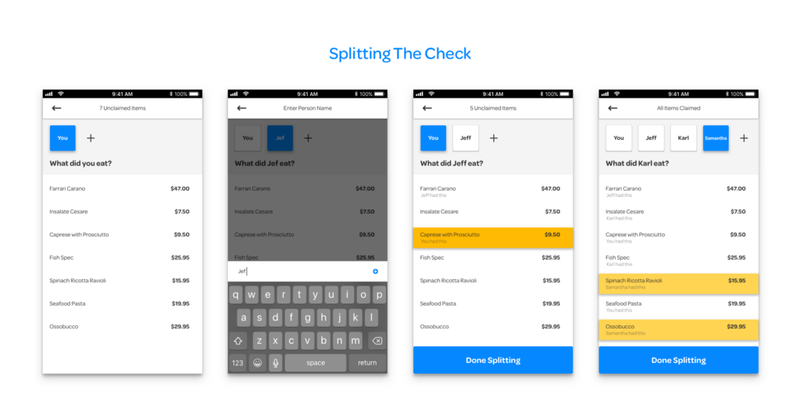 Paper Prototype — A paper prototype might have been a more flexible way to testing the splitting concept because there are a lot of ways to split a bill between multiple people. Backwards Navigation — Need to add a prompt that reassures the user that we’ve saved their progress. SplitHero: A UX Case Study was originally published in Prototypr on Medium, where people are continuing the conversation by highlighting and responding to this story.